The new 2013 Toyota GT 86 and Subaru BRZ have been touted as the best of the best buys in Australia by TMR. The two cars beat out a a number of worthy releases and new models for the record-setting 2012 calendar year. In the country down under, retail car sales last year have hit the magic million sales number in November putting the market squarely on track for a history-making record. And as TMR looked over the past year, they saw a year that produced “many very, very good cars.” The job of picking out the best of the best buys for their 2012 Best Buy Award had never been so difficult. It just shows how many really good cars are being manufactured today. The 2013 Toyota GT 86, (Scion FR-S in the U.S.), /Subaru BRZ jointly produced sports cars were designed by Toyota and Subaru to be fun and affordable. And they succeeded in a great way. Priced under $25,000 here in the U.S., they give buyers a value that is hard to find in other sport coupes around the globe. Akio Toyoda, who is the top man at Toyota, wanted to infuse some excitement into the Toyota brand and worked with Subaru to produce a winning car. The car brings a sporty rear-drive coupe that produces superb handling and balance, and is fun to drive for a price that most can afford. And buyers have been impressed also. The GT 86/BRZ/FR-S trio have been selling well around the globe and dealers can hardly keep the cars on their lots. In the U.S., the 2013 Scion FR-S is ranked the number four fastest selling car and stays on dealer lots for only 15 days before it’s snatched up by a buyer. The 2013 Subaru BRZ is the number nine fastest selling car in America and only stays on lots for 18 days. In Australia, sales have been so strong that Subaru needed to source extra production of its high-demand BRZ sports car in February and March next year. The extra allocation of 140 vehicles means customers due to receive cars from May onwards will achieve better than anticipated delivery dates. 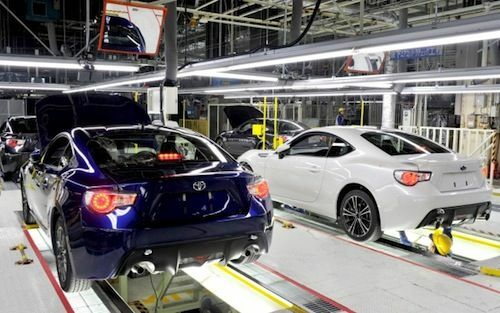 The 2013 Toyota GT 86/Scion FR-S/Subaru BRZ rear-drive sports cars are certainly one the best stories of 2012. The automotive industry is alive and well globally and these cars have set the table for an even more successful 2013.